The Purchase: A Rancher Had Been Taken Several Times By A Local Car Dealer. One Day, The Car Dealer Informed The Rancher That He Was Coming Over To Purchase A Cow. 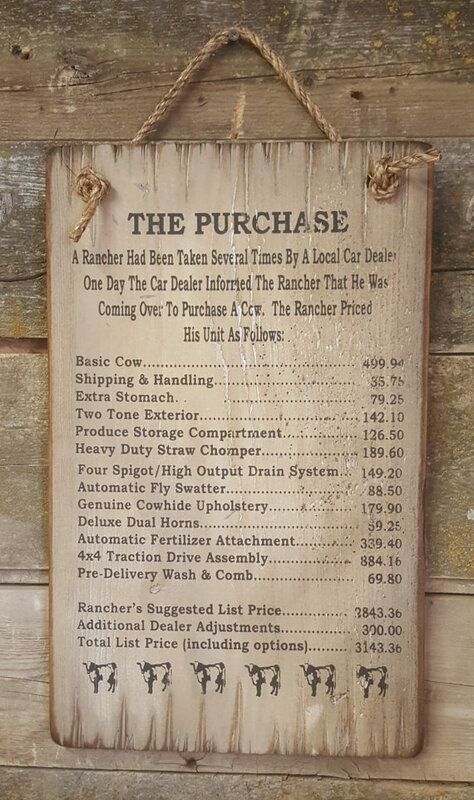 The Rancher Priced The Unit As Follows… This sign is a funny way of showing the “used car salesman” how you really feel about his pricing! This white background sign measures 11×18 and comes with the grass rope hanger for easy hanging. Handcrafted with pride! !